The C-17, from the 3rd Wing based at Elmendorf, was on a training demonstration for an upcoming weekend air show, Lt. Gen. Dana Atkins said. Anchorage Fire Dept. Captain Bryan Grella described seeing the crash from a downtown fire station about 2 miles away. "It was a big, gray plume of smoke, and I saw a fireball go up in it" and extend about 750 feet in the air, he said. It's the third airplane incident in Anchorage this summer. 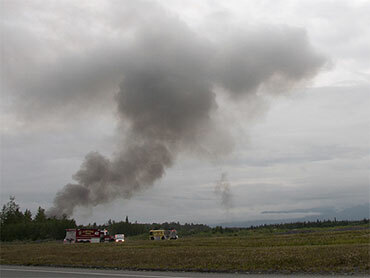 In June, one child was killed and four others burned when a small plane crashed after taking off from the city's small-airplane airport in downtown Anchorage. Days later, a small plane landed on the busy Glenn Highway, the only highway leading north out of Anchorage. There were no injuries in the latter mishap. Gov. Sean Parnell and Sen. Mark Begich issued statements late Wednesday expressing sadness over the crash and sending well-wishes to members of the military. "Alaskans are very connected to the military, and our thoughts and prayers are with Alaska's Air Force family," Parnell said.